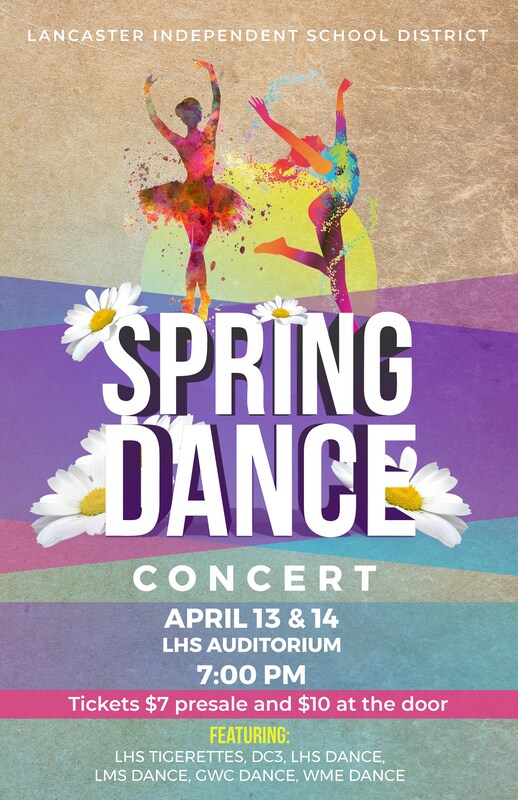 Mark your calendars and make plans to enjoy the Lancaster ISD Spring Dance Concert on April 13 and April 14 at the Lancaster High School Auditorium at 7:00 p.m. nightly. It is the culminating event for students in the Lancaster ISD Fine Arts Dance program. West Main Elementary, George Washington Carver 6th Grade STEM Learning Center, Elsie Robertson Lancaster STEM Middle School, Lancaster High School, DC3 and the LHS Tigerettes! Please make plans to attend this wonderful event on Friday, April 13 and Saturday, April 14 at 7:00 pm nightly in the Lancaster High School auditorium located at 200 E. Wintergreen Road. The ticket price is $7 Pre-Sale and $10 at the door. Prior to the performance, tickets can be purchased from the dance teacher of any of the participating students.